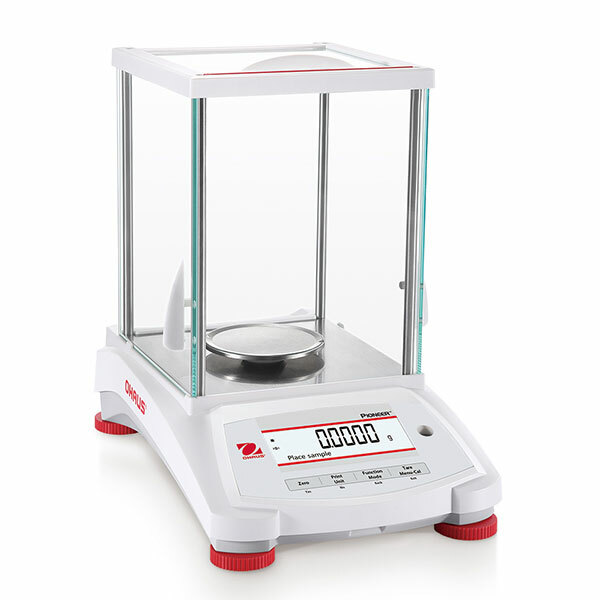 The Ohaus PX124/E analytical balance has a capacity of 120 grams with a readability of 0.1 milligram and comes with a 3.54" (90mm) diameter weighing pan. The Ohaus Pioneer PX combines essential weighing functionality with competitive performance, offering high accuracy and repeatability for applications in laboratory, industrial and education settings. The Pioneer PX is affordably priced, and intuitively designed for intelligent operation with a second line display for additional information, and USB and RS-232 connectivity for easy communication. Static Removal Bar A static removal bar along the top of the draftshield provides a convenient grounding location, allowing the user to discharge any static charge that may have accumulated prior to handling samples and weighing. This helps compliance with good weighing practices, while improving the stability and accuracy of results.